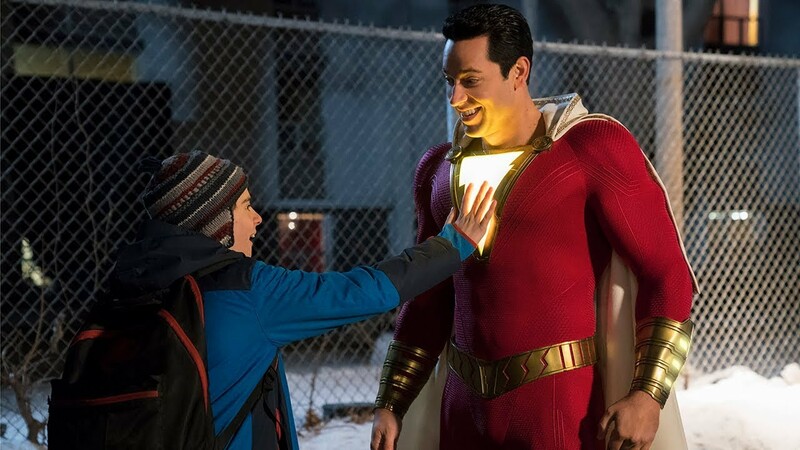 Adam reviews the unexpectedly heartfelt Shazam! The film is funny and charming in equal measure. Marvel, DC, Dark Horse… No one should honestly care where a Comic Book property comes from as long as it is an actual film and works as a narrative. Shazam! more than anything else works as a narrative and a film. Equally, the film will surprise and delight most with its ample heart and humor. With only marginal ties to a complicated Extended Universe, the Zachery Levi starrer should attract anyone looking for big goofy fun with a lot of heart. Billy Baston (Asher Angel) lives in Philly searching for his mom who lost him as a young boy. Jumping from Foster parents to Foster parents Billy is a good kid in a crap situation only wanting One thing; to find his birth mother. Moving into a new foster home with a pair of parents (the great Marta Milan and Cooper Andrews) and a literal gaggle of adopted kids lead by the wisecracking Freddy (Jack Dylan Grazer). In other movies this is a recipe for “comedic gold”, but here it’s a heady brew of comic book troupe, heart, comedy, adventure wrapped in an Amblin- style production. Billy through fate is sent to Shazam (Djimon Hounsou), an ancient wizard and defender of the earth, who grants Billy his abilities and, his moniker. Billy (Zachery Levi) as Shazam must navigate his way from typical 15-year-old to Super Hero, with a capital “H”. Shazam! rests on the charms of Both Angel and Levi. As Billy/Shazam both excel making star-turns in this unique performance. Many of these types of films rely on the gimmick of the “Bodyswap”. Though both actors ensure harmony of the mutual performance, director David F. Sandberg (Lights Out) never calls attention to this, rather allows the comedy, heart, and drama to play out and the performances to feels organic. In fact, this is Shazam!’s biggest asset. The film is designed to be character-based allowing for the plot to take the back seat which even in the best of these type of genre entries almost never happens. Part of the delight comes from Billy and Freddy’s friendship blossoming as Billy begins to understand his powers. Shazam! is a genuine surprise because of how unexpectedly it approaches the oft-told superhero origin story. Rather than reliance on Brawn, VFX, and general bombast, Sandberg and co. use comedy, heart, and humanity to get a Very different and delightful result. Few big-budget Super Hero entries defy conventions and trappings of their genre, Shazam! is one of them.